Lush mountains and incredible views are offered from these beautiful pieces of land in a rapidly appreciating South Pacific coast. Just thirty minutes from the Costa Rica's third new international airport this side of the country is how Guanacaste was some twenty years ago; underdeveloped, unpretentious and lush in vegetation and wildlife…topped off with very competitive prices and increasingly modern and expanding infrastructure, this area is already becoming an attractive option for investors. This development of just 29 lots is located in undoubtedly one of the most beautiful regions in the country; stunning long beaches, enormous national parks, mountains that come right down to the sea and the best scuba diving and snorkeling in the whole of Costa Rica (Isla del Cano). 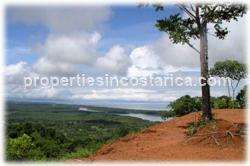 Each lot features incredible views of the ocean, and/or views of the luxuriant mountains and forest area. 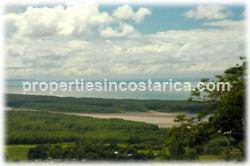 Some lots even have views over the bay, towards Isla del Cano and even over to the Corcovado National park. LOT 1: Lot 1 is perched in the center of the development at the end of a narrow spine adjacent to the cul-de-sac. 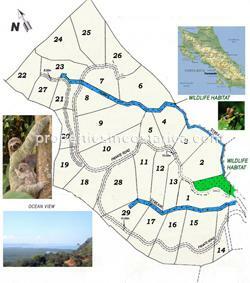 It is lower elevation and surrounded by lush green topical forest abundant with monkeys, sloths, pizotes etc. 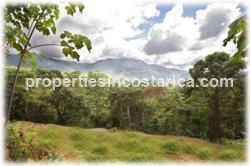 This lot is for nature lovers who wish a more tranquil location to relax. We refer to this as a "Jungle Lot". LOT 5: Is a Jungle lot nestled in the center of the development and extends down to the year round creek which is teeming with nature and a host of animals. It naturally has three terraced building sites, affording a creative person with the opportunity to create quite a beautiful sanctuary in paradise. LOT 6: Lot six is located on the eastern edge of the development perched on a knoll overlooking the valley and has a view southwestward to include Isla Violin and Drake Bay in the Pacific Ocean. It also is a multi tiered lot in which split level construction would best serve. As such, it would give the owner an ability to create an airy open design on multiple levels with un-obstructed view. It is bordered on the east my primary Rainforest, and the west by the year round creek and natural spring. LOT 7: Nature reserve and biological corridor. LOT 8: Is located in the center east portion of the development. It is a hillside lot with open valley views. LOT 9: Is also located in the center east portion of the development. It also is a hillside lot with open valley views. However it has an additional 2 natural terraces on which one could expand the home construction to incorporate a series of decks, pavilions, guest house or other garden setting structure. 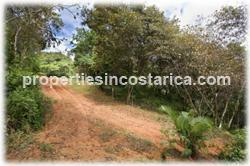 LOT 10: Is located in the upper center portion of the development. It also is a hillside lot yet on a gentle slope with more build-able area, and open valley views. It has an additional 2 natural terraces on which one could expand the home construction to incorporate a series of decks, pavilions, guest house or other garden setting structure. LOTS 11, 12 & 13: Are located in the center of our development on a ridge spine. They afford valley views and are ideal for open airy construction in order to capture the above it all feeling with views down the valley. LOT 14: Is located at the southern border of the project atop a knoll which would afford valley views and a view west to the Terraba River mouth and the Pacific Ocean from the second floor. LOT 15: Is located on the southwestern corner of the development at the bottom of the western ridge with a large natural building pad. From which a second story home would have a view over the trees to take in the Pacific Ocean, River Terraba estuary and the town of Coronado below. LOT 16: Is located on the southwestern corner of the development at the above lot 15 on the western ridge. 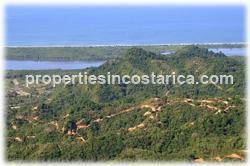 It affords both valley views to the east and a view of the Pacific Ocean, River Terraba estuary and the town of Coronado below. LOT 17: Is located on the southwestern portion of the development at the above lot 16 on the western ridge as well. 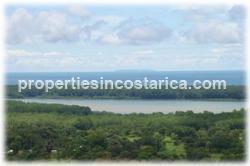 It affords both valley views to the east and even better views of the Pacific Ocean, River Terraba estuary, the town of Coronado below and views down the coast to Isla Violine and the Sierpe Delta. LOT 18: It's a spectacular view of the southwestern Pacific coastline. 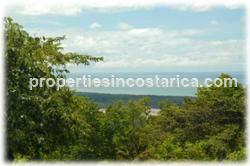 With views extending to Corcovado National park, Isla Violine, the Sierpe Delta and the town of Coronado it has a very large natural building site and a secondary pad which would be ideal for a guest house. This is by all measure on of the finest views in the development. 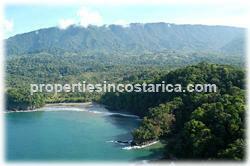 LOT 20: Is on the western border of the development with views South West to the Pacific Ocean and as far south as Corcovado National park, Isla Violine, the Sierpe Delta and the town of Coronado. Additionally it has a small view North West Pacific Coastline as well. LOT 21: Is on the northwest border of the project with great valley views as well as views as far south as Corcovado National park, Isla Violine, the Sierpe Delta. LOT 23: Is located on the northern border of the development and has views north over the Ojochal Valley, and up the Pacific coast to Uvita including Bahia Ballena. It also has an ample building site as well as a border area perfect for establishing Pavillion or terraced garden setting. 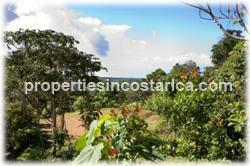 LOT 24: Is located on the northern border of the development and has views north over the Ojochal Valley, and up the Pacific coast to Uvita including Bahia Ballena. It also has an ample building site as well as 2 additional natural terraces on which one could expand the home construction to incorporate a series of decks, pavilions, guest house or other garden setting structure. LOT 25: A true nature lovers dream. Located in a valley adjacent to a steam surounded by LUSH LUSH tropical rain forest. It also has in fact three very LARGE building sites and in fact could be subdivided as well. LOT 27: The premier lot in the development affording a 360 degree view. Both up the Pacific coast to Uvita including Bahia Ballena., over the Ojochal Valley, the Tres Rio's Valley, and down the coast extending to Corcovado National park, Isla Violine, and the Sierpe Delta. This is by far the most spectacular view lot. 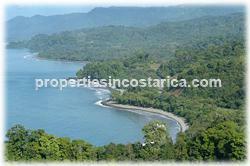 LOT 29: Is located on the western rid ge of the development with fantastic views west to Isla Cano, the Rio Coronado, Terraba estuary, and as far south as Corcovado National park, Isla Violine, and the Sierpe Delta. The road, water and electrical infrastructure is something of great importance – it is going to be first class in this project; additionally there is already water, electricity, telephone and internet. And of course, with copious mountain springs there will never be a problem with water! As previously mentioned, a new international airport is planned for the area, just outside Palmar Sur which is about 30 minutes away by car. Additionally a large hospital is being constructed close to the town of Cortés, just 20 minutes away. And an even more attractive feature is that a large marina is being built in Golfito… there is so much happening now in this region and once these are all in place we estimate the property values will double in price within a couple of years. (This was what happened in Guanacaste after the development of the Liberia international airport). And, given that this region has greater natural beauty it is quite likely that that an ocean view property in this development will have an even better earning and investment potential.